While employers are recognizing the potential of data-driven healthcare analytics to better manage their healthcare benefit spend and reduce waste and inefficiencies, most analytics providers are only solving half the predicament. “The true prospect of the Population Health Management solutions can be achieved only when organizations don’t stop with predicting the health concerns of their employees, but are capable of prescribing and implementing solutions to solve those issues,” states Jim Pritchett, CEO of DHS Group. Comprehending the shortcomings of the healthcare analytics industry and upping the game, DHS Group offers a comprehensive prescriptive health analytics platform for employers. Dubbed HealthSpective, the platform stipulates action items for employers while also engaging employees to elevate population health. To establish the grounds for such an integrated approach to population health management, DHS Group has designed their platform with a robust analytics engine that is fortified with employee engagement modules. 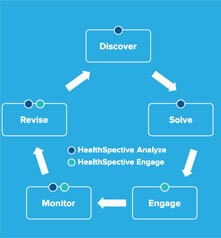 The HealthSpective platform powers two applications, Analyze and Engage. Analyze helps companies comprehend the demographics of a company’s population and compare it against an expected benchmark. The thorough analysis provides organizations with an opportunity to view the complete picture of the population’s health and their total health spending, identifying specific items that can be addressed to make cost and quality improvements. Pritchett deems the fact that without an individual’s positive will and engagement to “own” their health and switch to a healthier lifestyle, no analytics in the world can help. To this end, HealthSpective Engage provides a unified health information management platform that helps individuals keep track of all their medical records in a single platform. Underpinned by an advanced data warehouse, Engage provides a portal for employees to get monthly reviews of their own health records, engagement and risk scores, net spending on healthcare and proactive measures that they need to undertake. Explicating a real-life quandary, Pritchett mentions the challenges faced by the largest and the most comprehensive health management system in South Carolina Midlands— Palmetto Health. Problems arose when they had to maintain disparate health plans for family medical leaves and disabled employees, coming from two pharmacy data feeds—dental and vision. Palmetto wanted a solution that integrated the data from these two sources and several others to understand the group’s healthcare costs cohesively. 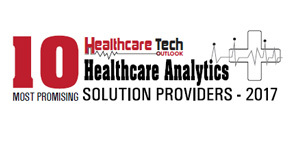 Using HealthSpective Analyze, Palmetto Health implemented a data integration program to deliver novel analytics and transform disconnected data into actionable intelligence and insights. “To further increase employees’ participation, we have revolutionized the member engagement approach through gamification,” Pritchett adds. The Move module—a software package using activity tracker and engaging group-based dashboards to provide real-time feedback on activity levels— utilizes gaming psychology to encourage people to get moving. Employees challenge themselves or compete against colleagues to score higher health-points. Meanwhile, employers can incentivize these engagement scores through their benefits program.